‘food you can’t say no to‘ is the latest recipe book by one of my favourite food writers Tamasin Day-Lewis. 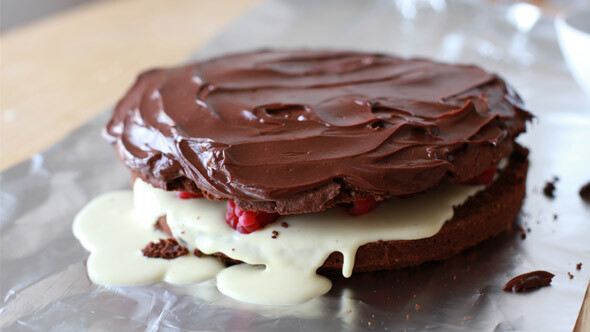 It’s full of tasty ideas, like the ‘Killer black & white chocolate & raspberry cake’ made with flourless chocolate sponge, fondant icing and white chocolate cream spilling out, above and below. I like Tamasin’s approach towards food partly because she champions top British food producers like Richard Vaughan, who farms Longhorn cattle and other rare breeds at Huntsham Farm in Herefordshire. Along with high welfare meat, she also recommends the best and most delicious ingredients, for example thick Jersey cream in her ‘Passion fruit posset’ or Marcona almonds in Gâteau Basque. Tamasin is perhaps best known for her recipe book The Art of the Tart (and of course, more generally, for being the sister of Daniel Day-Lewis). I also have her Kitchen Classics book from 2006, which contains some very grown-up recipes and a few that we cook time and time again. This latest from Tamasin has become one of the most thumbed recipe books on my shelf. The sweet recipes and photography by Simon Wheeler helped persuade me that staying off sugar for a month was futile. I’m talking about her deep, creamy Torta della nonna, Bitter chocolate & salted caramel brownie cake or the chocolate cake in this post. On the savoury side, she’s included a recipe from one of my favourite restaurants, Lebanese street food joint Yalla Yalla – tart, soft chicken livers cooked in pomegranate molasses. I recently made up her Spicy lamb kofte with honey miso sauce. As I was mixing together the miso paste and tablespoons of honey, dijon mustard, tamari and cider vinegar (along with ginger and garlic), I began to panic it was going to taste crazily salty and sharp. But, no. It was honestly the BEST accompaniment to kofte and I’m going to try basting leg of lamb with it as she suggests. Clever ideas like these are peppered throughout the book and there’s plenty still to try as spring turns into summer, like her Primavera & prosciutto pie. So far the only recipe I’ve not fallen in love with is Deborah’s seafood & noodle salad – I’d go for Cousin Deborah’s salmon recipe in Tamasin’s Classics book, which uses similar Thai-inspired ingredients, but is a cut above. A lovely book from a super food writer. Worth getting a copy if you can. food you can’t say no to (Quadrille, £20, published March 2012). Note: I particularly like the dark chocolate fondant and white chocolate cream filling in this recipe (below), although I could have chilled the latter for longer, as you can see from the picture above. That said, it is almost a dessert of a cake. The flourless sponge contrasts nicely with all that cream and chocolate and has a very nutty flavour. In my case, I found the cake had an almost crumbly, crunchy texture and if you wanted something softer and richer you could always substitute it with your own chocolate cake recipe. The raspberries add a lovely contrast. You’ll need two 8 inch/20 cm buttered, loose-bottomed cake tins. Pre-heat the oven to 170 degrees C/Gas Mark 3. Finely grind the almonds and hazelnuts in a blender or food processor; set aside. Melt the chocolate in a heatproof bowl over a pan of barely simmering water, making sure the bowl is not touching the water. Meanwhile, using an electric mixer, whisk the egg yolks with half of the sugar until pale, airy and doubled in volume. In another large, clean bowl, whisk the egg whites until they hold peaks, the gradually whisk in the remaining sugar until it is all incorporated and you have a satiny, softly peaking meringue. Add half the meringue to the whisked egg yolk mixture and fold in lightly. Pour in the melted chocolate and carefully fold in, followed by the rest of the meringue and finally the ground nuts. Scrape the mixture into the prepared tins and stand them on a baking tray. Bake in the middle of the oven for 25-30 minutes, until a skewer inserted into the middle comes out clean. Place the tins on a wire rack and leave the cakes to cool. For the filling, heat the crème fraîche in a small pan just to scalding point then remove from the heat and stir in the white chocolate. Continue to stir until melted and smooth. Allow to cool, then chill to firm up slightly, to a thick pouring consistency. Unmould the cakes and place one on a large plate. Pour on the white chocolate mixture and scatter the raspberries on top. Sandwich together with the other cake. 06 May	This entry was published on May 6, 2013 at 9:07 am. It’s filed under Recipe Book Reviews, Recipes and tagged chocolate cake, food you can't say no to, recipe book, review, Tamasin Day-Lewis. Bookmark the permalink. Follow any comments here with the RSS feed for this post.